Locke came out a few weeks ago but something about the title or the dvd cover just bugged me. Based on name and cover alone, I figured it was some sort of slow crime movie. Had to push it back. Too much energy to appreciate a slow crime movie. The reason I finally decided to give it a shot is because I saw The Drop, and gosh darn it, Tom Hardy just keeps impressing me with the roles he has produced. He isn’t just some guy who can bulk up and do action scenes. He is an actor, so I want to see the man act. Well, it turns out this movie is much better defined as drama. Not drama crime, not drama thriller, just straight up dramatics. 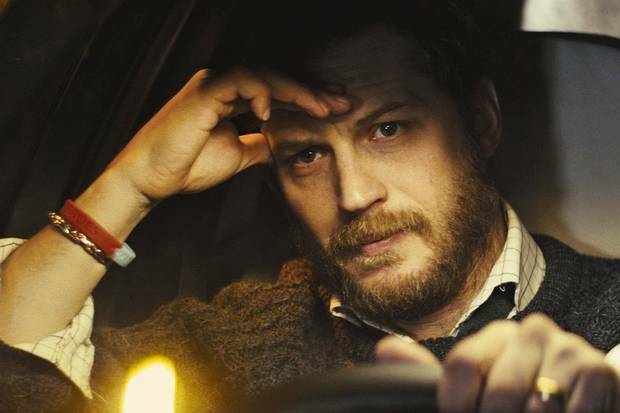 Ivan Locke (Tom Hardy) is a construction foreman who lives and works about 90 minutes outside of London. It is late, another hard days of work, prepping for a huge cement pour job the next day. The biggest in all of England really. A lot of things can go wrong and he is one of the most qualified men to handle it. You see, Ivan is a hard worker. He has been doing this job for a nearly a decade, he is reliable, a nice guy, a stand up citizen, someone who could do no wrong. His wife and son are waiting for him at home to watch a football match. But as he leaves work, he is heading for London, not for home. You see, Ivan had a moment of weakness. Seven months ago he had a sexual relationship with a woman. It was incredibly uncharacteristic of him, but it happened. Even though he barely knows her, she is in London now undergoing a premature birth. So now he is trying to make things right. He is going to be with her and see the birth of his baby. During this time, he had to email that he won’t be in at work tomorrow, one of the most important days. He has to call his wife and tell her of what is going on. He has to call the hospital as the woman is all alone and has no one else to talk to but him. And he has to help the work operation go off without a hitch with a lot of bosses getting mad at him. The other characters are voiced by Olivia Colman, Ruth Wilson, Andrew Scott, Ben Daniels, and Tom Holland. But you know, we only get one face. You will get no diversity in pictures from this movie. NONE. At least from my point of view, Locke was everything that Cosmopolis wanted to be and more. Cosmopolis felt like a weird fantasy film thriller thing, with a lot of it taking place in a limo. It suffered from vagueness despite the good ending. Locke takes out any vagueness and lays everything bare on the table in front of you, like one of those Nantaimori models. Technically a type of bottle movie, but also a sort of one man show. Other movies like Buried or Brake feature one man as well, but those men are literally trapped in boxes versus Locke where he is trapped in a sort of moral quandary. The character Locke is very clear with his convictions and unwavering with his goals, and you can’t help to respect that despite his dickish act of betrayal. It is hard to feel so attached to a character normally, but when truly watching this film you will feel like a silent passenger in the car with him. It is an extremely morally resonant film and one where you won’t necessarily know how to feel by the end. Sorry dude, I just finished this and did not like it half as much as you did. I mean, I get the challenge of storytelling of having a single on-screen character in a single location, and I get that a lot unfolds in real-time that affects an individual person’s life, but Locke just wasn’t that interesting or compelling a character.